Sunny side up: Holly O’Mahony contemplates 42nd Street’s escapism amid 2017’s political turbulence. If you’ve spent enough time in London over the past few months you’ll probably have seen advertisements for 42nd Street beaming down from buses, or gleaming throughout underground stations. It’s the show with branding strangely reminiscent of a jar of Marmite in colouring, typeface and even curvature of logo. And, like Marmite, this revival of Mark Bramble and Michael Stewart’s smash-hit musical is likely to divide audience opinions into those who are perfectly content with a night of all-singing, all-dancing escapism, and those expectant of a little more substance. 42nd Street – which is based on the 1933 Hollywood film adaptation of Bradford Ropes’ novel – was originally produced for Broadway in 1980, where it became a long-running hit after winning the Tony Award for Best Musical. Judging by its track record, there’s no reason why another revival won’t delight a London audience once more. But are its themes charmingly old-fashioned or irritatingly outdated? And why is an American musical set in the 1930s more to our liking than, say, a new musical satirising our current political climate? Watching 42nd Street is pure escapism. The world depicted in Bramble and Stewart’s musical is not without its problems, but these are largely outlawed to the context, rather than the narrative of the show. Outside the theatre, America is living through the first few months of the Great Depression, yet the biggest drama on 42nd street revolves around bossy musical star Dorothy Brock breaking her ankle, and ruthless director Julian Marsh taking a needs-must risk by replacing her with young, talented and hopeful Peggy Sawyer. The show must go on, after all. A few bumps along the road later and it’s happily ever after. Set in New York, and way back in 1933, 42nd Street feels far removed from our current Trump-ridden, Brexit-fuelled dystopia. Perhaps there are some similarities, though. The pastel coloured outfits, polished smiles and mechanically synchronised tap routines are manically driven by Marsh, a man so hell-bent on filling a spot in his musical he claims he’ll pick the first woman he sees on the street to do it. The American public took a seemingly similar gamble in choosing a billionaire property tycoon for president last year. But that’s arguably trying too hard to find relevancy and depth here. And why bother? Perhaps what we need after hearing reams of hard-hitting news is to lose ourselves watching a cast perform visually captivating dance routines to high-spirited songs. Harry Warren’s music and Al Dubin’s lyrics offer just that, relaxing us into the Lullaby of Broadway – as one song neatly describes it – with a bold and dreamy brass score. Both ensemble and lead performers are mesmerising. Sheena Easton’s note-perfect voice as Dorothy Brock will have you sit up in your seat, hopefully in time to catch every second of Clare Halse and Graeme Henderson’s dancing, as Peggy Sawyer and Andy Lee respectively. Emmerdale’s Tom Lister is also particularly good as dictatorial director Julian Marsh. However it’s Randy Skinner’s choreography coming together with Douglas W Schmidt’s set design, Roger Kirk’s costumes and Peter Mumford’s lighting that makes 42nd Street the visual spectacle that it is. This masterful team have the dancers popping out of doll’s house windows, floating across the stage as silhouettes and, in one particularly memorable moment, lying on the floor forming pretty patterns with their arms and legs as we watch through a mirror hovering above them. “What do you go for? Go see a show for? Tell the truth. You go to see those beautiful dames,” belts out Billy Lawlor (Stuart Neal). Judging by the whoops and cheers across the auditorium, it seems – albeit a little basely – that the beautiful dames are what we go see a show for in 2017 too. The musical within a musical element of 42nd Street beckons us still further away from reality. It’s clever and it’s meta. Amusingly, the dazzling finale to Marsh’s Pretty Lady (said musical within 42nd Street) was a sensational enough ending on press night to confuse a small gaggle of photographers, who came marching down the aisle to get their closing snaps before an usher called them back. “Every situation has a sunny side,” sing 42nd Street’s cast at the beginning of the second half. Perhaps a comeback for much-loved musicals is the sunny side to our current political situation. 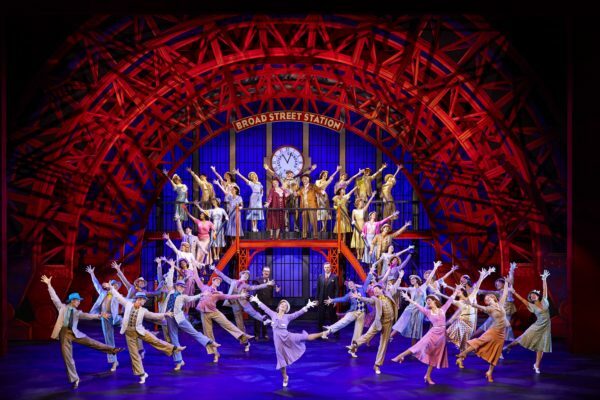 42nd Street is on at the Theatre Royal Drury Lane until July 22nd. For more details, click here.